Our version of the Kate Moss "Belstaf" biking boot in a range of smart and soft nappa leathers all with a luxurious leather lining. The full rounded toe provides a stylish but comfortable fit. The buckles on black and navy versions are silvered and on the browns they are bronzed. 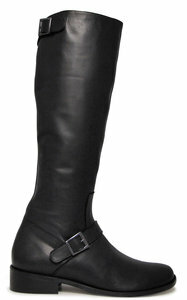 Full length zip and a concealed stretch panel in the top of boot. Photos show black and waxy brown versions from a variety of angles, as well as a single shot in dark brown as well as a wider calf tan milled example.